While I found the notice that I had been awarded their Lifetime Achievement Award flattering, the inclusion of a rather dear buy-it-now link on the page for a copy of the 2017 edition of the narrative and distribution package (for just under $900) to be, well, sobering, I understand it. Perhaps it reduces the honor and that special snowflake feeling one might have retained from the notice? Sure it does. A little. 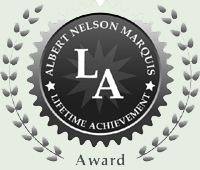 "A special feature on the Marquis Lifetime Achievement website. "A professional narrative documenting accomplishments with online distribution (suitable for physical distribution as well). "An expanded biography uploaded to Marquis Biographies Online (MBO), our expansive database that features more than 1.5 million of the most distinguished professionals from around the globe. "Access to MBO with username and password. "A framed narrative for home or office display." So yeah, if I were in an industry that relied upon leveraging this sort of publicity for position, I can see how someone in such a position might consider that a reasonable expense. Especially considering that the award comes from one of the older publishers in the Who's Who industry. But as I am not, all I can say is hey, thanks mates! But I won't be buying the PR package. If you are thinking that the award is part of a scam, it's not. The PR package is not a scam either. They are both part-and-parcel how that particular industry has always done business, and there is nothing wrong with that. If you have a blank spot on your "I Love Me Wall" then by all means buy the package - and while you are at it, why not also buy some of the rather pricey personalized keepsakes from that page on their site? The leather travel wallet and some of the desk clocks really are rather attractive. So yeah, the Marquis Who's Who is not the vanity version of a Nigerian scam - but there are a lot of Who's Who offerings that are. Want to know how to tell if they are the sort that exists only to milk your vanity via your wallet? If the "award" implies you will only receive that honor and award by spending money - or they charge a fee for the basic listing in their book - and a fee to pay for the "award package" - which naturally includes a certificate suitable for framing, a nice selection of plaques for that "I Love Me Wall" and of course, an extended listing in their book itself, which will also cost you extra. If that is the case, then yeah, that's the other type of Who's Who. Since Marquis grants the award whether you buy the package or not, it doesn't fall into that category. Oh, it's still largely a vanity offering. And accepting an award from the latter type always results in a call or three from their sales people who want to sell you a plaque, certificate, and etc. The bottom line is that legitimate offers don't include a fee for having your bio included. If they invite you to have your bio inserted - and offer you an achievement award - they would not request a fee if they are legitimate. So if you get an award - or an offer to have your bio added to a Who's Who book, you will want to carefully read the notification and their website. Because if they offer you services for a fee, it's not an "award" It's paid vanity advertising. One sure way to determine which sort it is for free is to go to the Better Business Bureau in the home state for the book publisher and check that company out. The bad ones have lots of interesting comments from customers who experienced their relationship with that company as a rather negative one. Just saying. So yeah, I am flattered by this award. Flattered, and maybe a little honored. And even then, with a grain of salt.